The color for September is orange. I know some of you have been waiting anxiously for orange to appear, and now is the time. It promises to be a rainy weekend around the Florida peninsula. Sounds like a great excuse to stay inside and get some sewing done to me. I think there are still some dark scraps hanging out waiting to be used up. 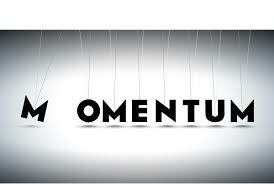 This is the last indigo weekend, so I hope to make some headway. The weeks have gotten busy with back to school fun. Open houses, play practice, lacrosse and football have kept us from having many dinners as a family. The kids are all hoping that hurricane Erica will keep us home on Monday. I don't think they are right, so I'm enjoying Saturday and Sunday instead. MisterLinky is below, please share the last of your indigo blocks and check out the rainbow happiness of the other RSC quilters. 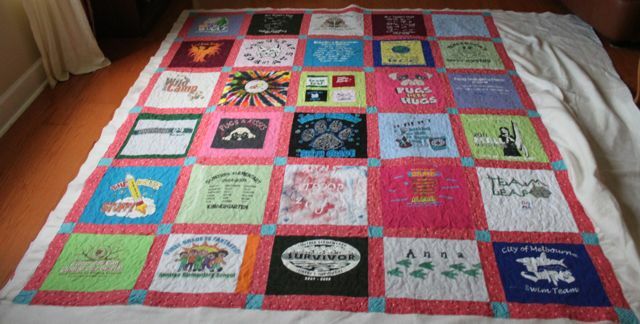 After pulling the leftover string quilt off the frame yesterday, I still had a bit of energy left and went ahead and loaded Anna's t-shirt quilt. I'm thinking of brown for the binding on this one. There were three quilts hanging over the frame yesterday waiting for a turn at quilting. This one was the smallest, so it got to go first. It started as a drawer of extra string and crumb blocks from my men's shirts phase. 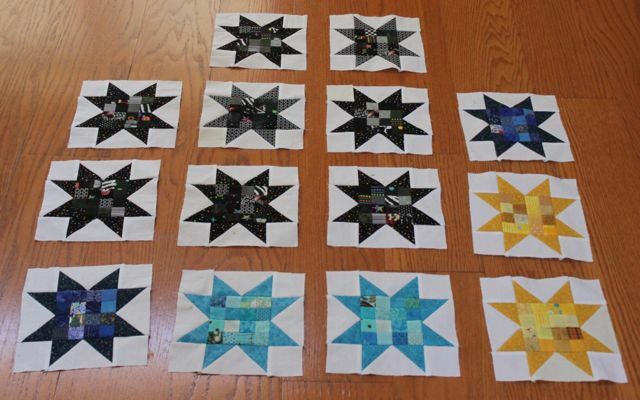 The homespuns for the borders were really stretchy to work with. 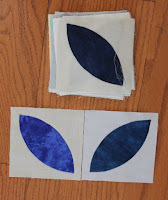 I am thinking about blue for the binding. 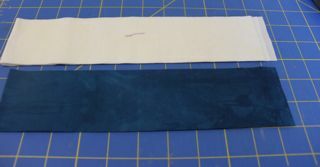 As soon as I get it sewn on I will be able to settle in for some calm hand sewing time. When I wasn't quilting this yesterday I got lots of laundry done, took Ryan to play practice and puttered around in the sewing room. So nice to have a calm and peaceful weekend. The men folk are off to Dungeons and Dragons this afternoon and Anna has a date. That will just leave Sydney and I at home. There is still plenty of time to keep working on the darker scraps. I am glad to have another two Saturdays to play after being gone for the last two. Hopefully you are all clearing out the dark blues along with blacks or grays. Mister Linky is below so that you can share your blocks. Getting used to being back at home again is going to take some time. Being is Costa Rica was so awesome! It was so nice to get home again though and wash the smelly laundry and air out the boots. 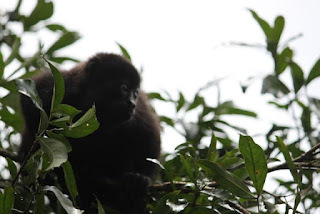 Sleeping in air conditioning again is a real treat, but I do miss the morning call of the Howler Monkeys. I did carry along my orange peels. I worked on them during the flight down. 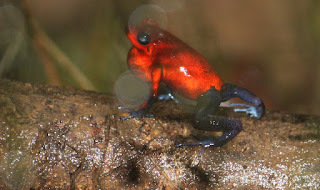 After that there was no way I was getting them out and risking exposure to mud and bugs and humidity. 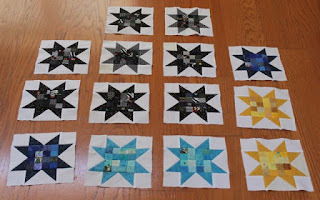 I thought I had gotten quite a few done, but when I pulled them out to take a peek, there were only 2 and half finished blocks. Slow and steady, wins the race. We will have another car trip someday I am sure and they will get done eventually. 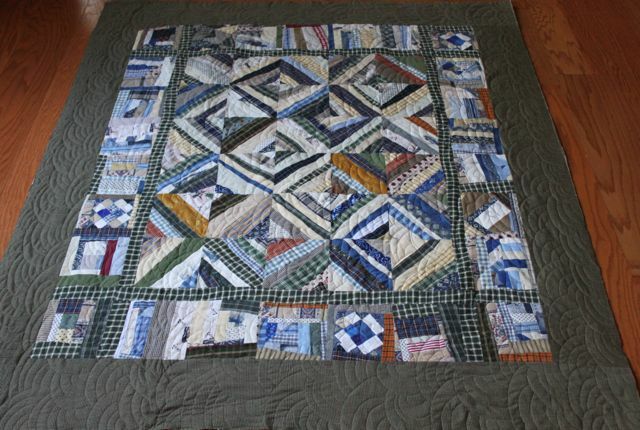 Others are also sharing their handwork at Kathy's Quilts, be sure to pop over and see what they are up to. I had cut out a few more goose blocks to surround postage stamp blocks before I left. Mostly black, but a few in dark blue an extra leftovers from earlier months. 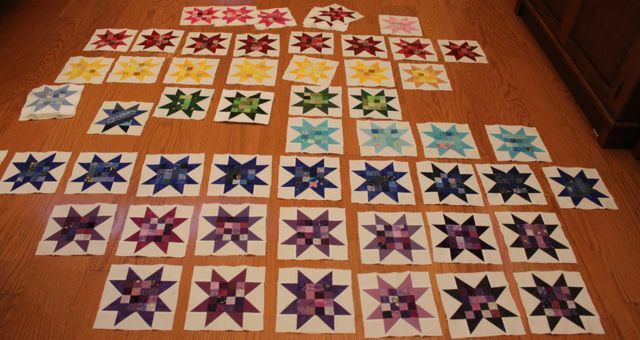 I have 85 block now I think, which is more than enough for a twin quilt, but I will keep going and let the extras carry over for next year's quilt. 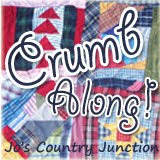 I think it will be the same block, but with crumb centers instead of the postage stamps. Sorry for the late start today. It is two hours earlier in Costa Rica, and I have lost all my normal methods for keeping track of the days of the week. 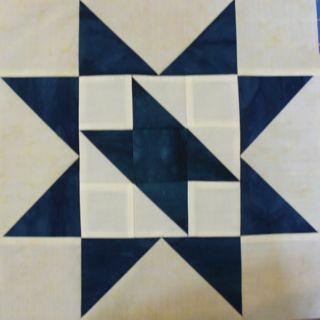 I'll be headed back today and hope to catch up with everyone soon, but for now, misterlinky is available for everyone to share their indigo or dark blocks. 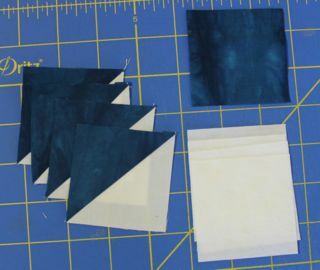 You will need 24 indigo squares cut 2.5 inches each Use 16 of them with 16 background squares to make 8 four patches . 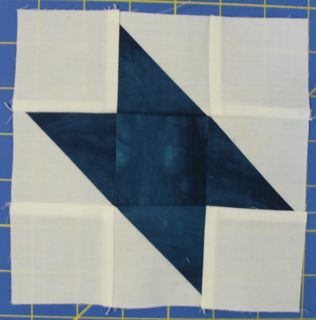 In addition you will also combine 6 indigo squares together to make 3 two patches. 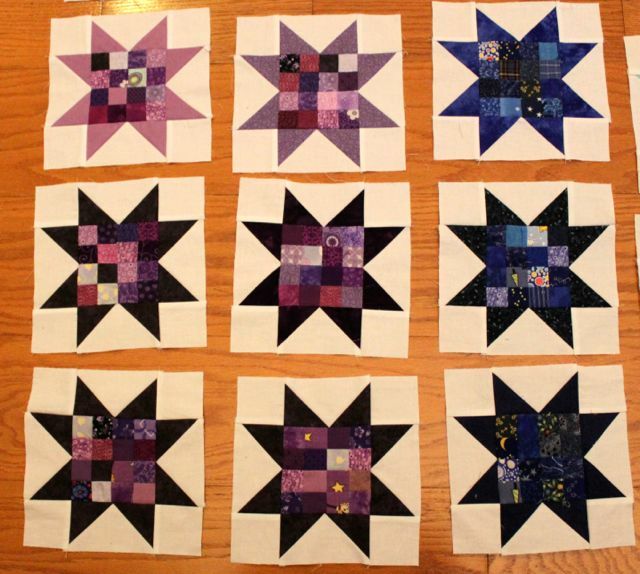 The remaining squares will combine with purple squares from earlier. 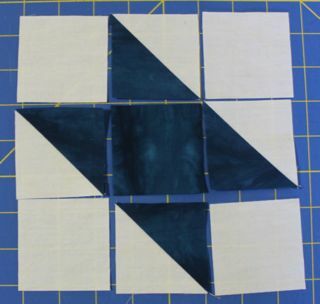 The Indigo blocks will make a "W" over the three indigo sampler blocks which form the second row of our quilt. This is how things are looking so far, though the pink and yellow blocks forming the bottom row seem to have gotten cut off. Row 2 and 3 are complete. 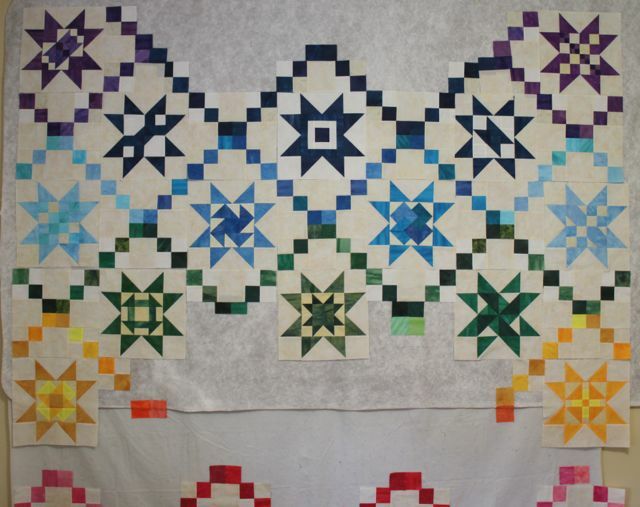 It is starting to look like a quilt, isn't it? I hope you are all having a great ScrapHappy Saturday. Obviously there has been no sewing for me since the flight to San Jose last week. I thought I would pull out my orange peels to share with you all, but I don't want to get them out of the bag as everything here is damp and muddy. Still, share your own progress and cheer each other on until I return. 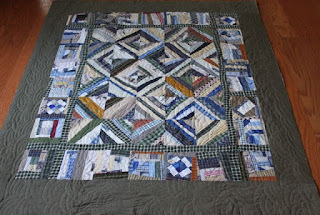 Most of the Road to California blocks I have seen are more complicated than this simple version, but given that we are working with a 6 inch block, I thought this version from my Quilt Block Bible would work well. 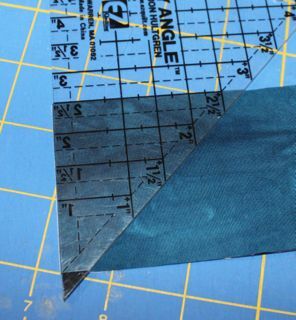 This is a basic nine patch block, so it works on a 2.5 inch grid. Everything you need can come from strips of indigo combined with background fabric. 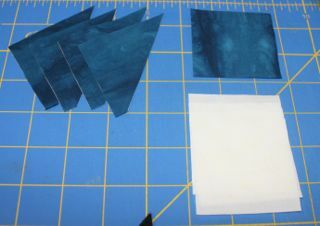 Start by placing the background and indigo strips right sides together and use the easy angle ruler to cut 4 HST units. Sew the HST units together, trim dog ears and you are ready to go. 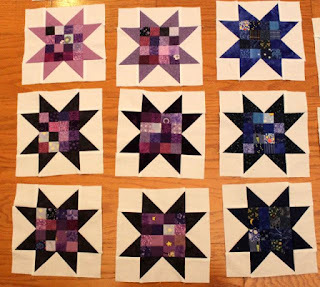 Place your squares together in a nine patch grid with the dark square in the center and the background squares in each corner. Notice that the HST units form a strong diagonal line in the center. If you rotated the HST units differently, you could also make a friendship star. Sew your nine patch together and you are ready to go. Go ahead and add your star points to finish up your block. 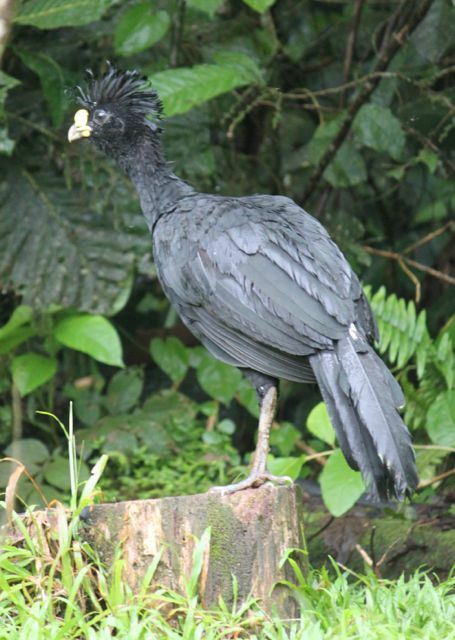 If you are wondering what I'm up to these days.......I am out roaming the jungle. 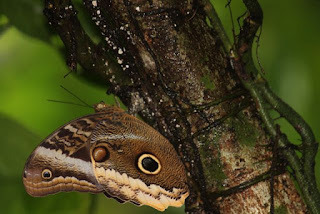 Feel free to check out the link to my Costa Rica blog in the left margin, just know that it might be a while before I have time to sew much. 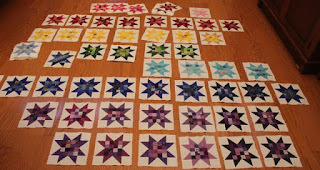 I've been working on the Postage Stamp Stars and wanted to pull them out to see how far I've still got to go. Definitely needs orange. Orange has always been one of the colors generally avoided in my stash. Since the Rainbow Scrap Challenge though, I've tried to round things out a bit. Hopefully I'll find enough to brighten this collection up a little bit. 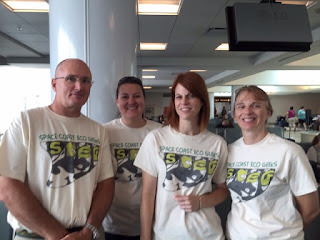 The Space Coast Eco Geeks are on the way to Costa Rica. 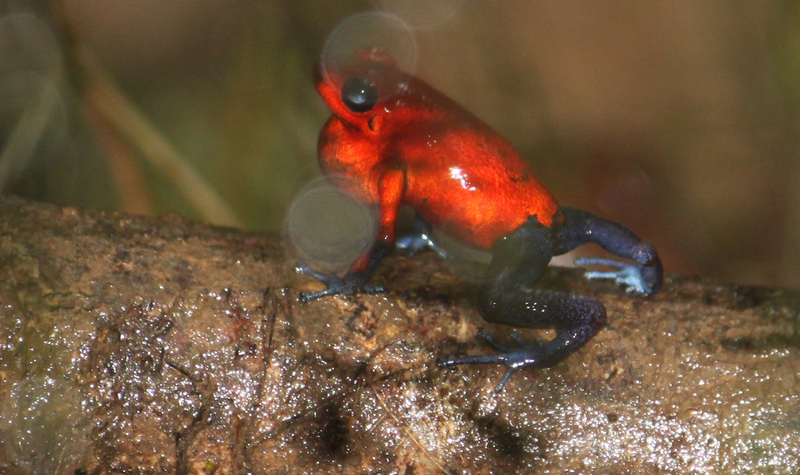 Ready for two weeks of intensive training in ecosystem monitoring. 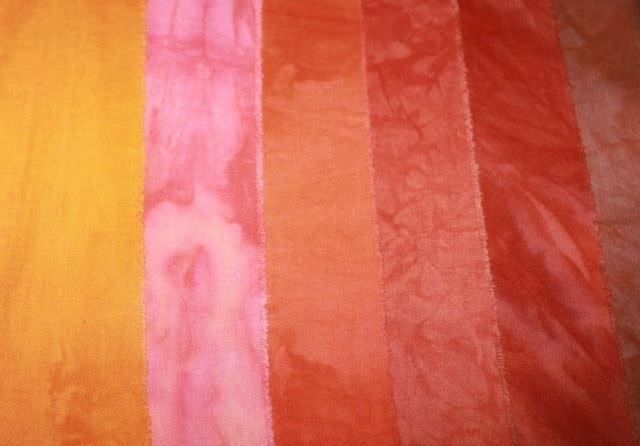 Welcome to a new month at the Rainbow Scrap Challenge! This is your chance to try to work in some of your darker shades. 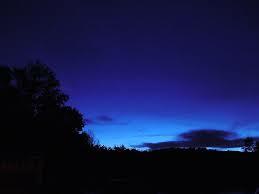 Dark blue, dark purplish blue. If you don't have those, how about black or grey? Hopefully one of those shades will work for most of our rainbow scrappers.